When last did you sit down to have a roll of nicely well-made enchilada, I bet it has been a while. Well, I can boldly say it hasn’t been that long for me, I tasted some of the very best ones recently, and I decided it’s time to let people also share in these recipes. I know most of you have made enchilada at one time or the other, it is hard to resist trying out those tortilla wrapped beauties, but the fear of having them turn out too soggy keeps people at bay. It can be quite embarrassing to have enchiladas planned out on the menu with some amazing sauce, only to have the whole plan go wrong. We are going to take a look at some enchilada recipes (which do not involve over sogginess) and then see some appealing sides as well. 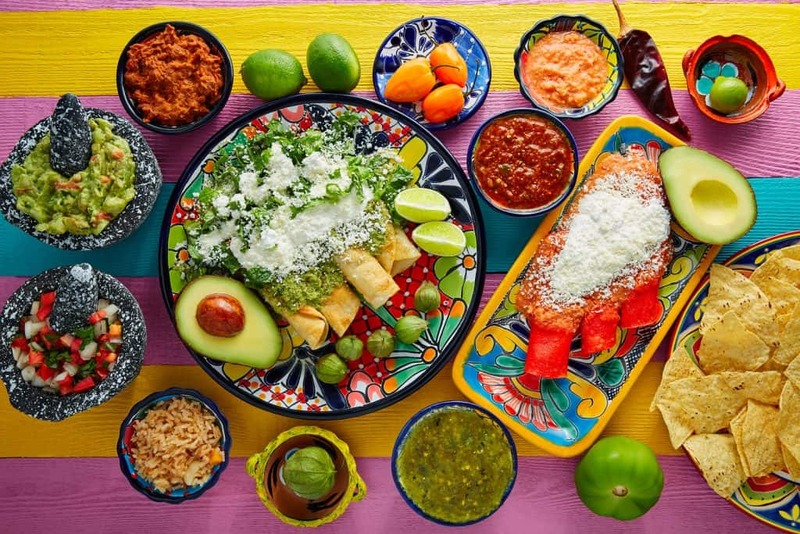 Enchilada is a very famous dish of Mexican origin which is characterised by the rolling of tortillas with the already prepared filling of any choice and then topping it with sauce. This filling can involve meat or any seafood and the toppings are usually chilli sauce. Enchiladas are very versatile dishes in the sense that they can be put together using almost any kind of ingredient or food, such as beans or cheese. 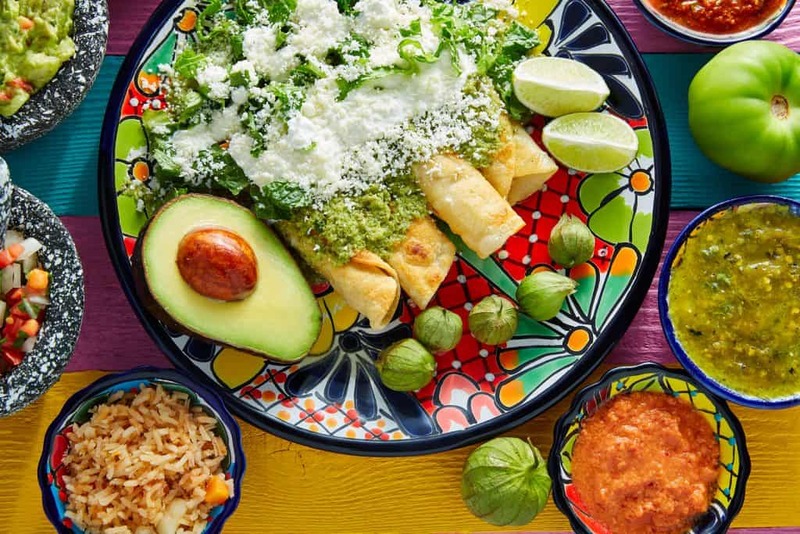 In ancient times, enchiladas were seen more as a street food patronised by tourists rather than a staple dish; it holds its origin from the Mayan people of Mexico with enchilada being an everyday meal within the population of that tribe. As early as 1831, enchiladas were featured in a Mexican cookbook called “El Cocinero Mexicano”. Chicken enchiladas are one of the best to prepare, and if you want to make it classy and customised then make the sauce yourself, what’s the harm in trying? Making the sauce instead of buying an already canned one allows you to put in as many ingredients as you want and monitor the taste as well. This chicken enchiladas recipe by Dash of Evans is all yum, she made use of green chillies which is milder than the regular red ones, so if you wouldn’t want your enchiladas so peppery, this is the recipe for you. Now, this is a very nice twist to the traditional enchiladas, rather than wrapping the tortillas around the filling, you simply stack up the ingredients layer by layer then let it bake. I like this recipe by Gimme Some Oven because of the ingredients used which were mostly corn, beans and chicken. Another reason why I like this dish is because of the health benefits, and the recipe is quite detailed, you can substitute the chicken with beef or anything else you like, the colour also looks gorgeous and alluring. If you are a fan of walnuts then you will be pleased with this recipe by Fannetastic food, they made use of wall nuts and mushrooms instead of meat, and it turned out so beautiful, you wouldn’t even miss the meat. After chopping up the whole thing in the food processor, you will be surprised at the beauty of the outcome. If vegetarian enchiladas are what you have in mind, then this is hands down the best recipe for you. You are getting all you need in one plate of enchilada. This is a well-suited side dish for your enchiladas. If you are not up for the intake of any mayo in your coleslaw, then this vegan jalapeno cabbage slaw by Simple swaps is perfect. Look at the colour of that coleslaw! It makes you just want to dig into it, and the final presentation with the avocado is pleasant to the eyes. The only thing that might pose a form of challenge is the refrigerating time it takes, so be sure you have all the time before you use this recipe or better still start the preparation ahead of time. Going by how soft enchiladas are, you might like to pair it with a side that is more firm, like a zucchini. This grilled zucchini by Valerie’s Kitchen is a fit for a side. It is straightforward, and I like the final product after grilling. Line a few of these up beside your enchiladas and you are done with serving. The recipe shows all the necessary steps to follow including what ingredients to use for the marinade. You can get creative with your zucchini by cutting them in different shapes other than the usual long straight slices, just to make a difference. If you don’t want to go with vegetables all the way for your enchiladas then go for some guacamole, like this one by She Likes Food. If you haven’t tasted some Chimichurri before, this is a good avenue to give it an attempt, she made use of Chimichurri and avocado, and the result is just breathtaking. When done with the guacamole, pair it with a layer or two of some enchiladas then sprinkle some chips by the side, the combination of these three are a must try. Go for it and let me know how it turned out for you. Enchiladas can quickly become an everyday dish in every home because of the many ways the stuffing can be achieved; the trick is to think up something creative anytime you want to have it prepared, keeping in mind its nutritional aspect and of course the side dishes. If you have been battling with soggy enchiladas, then you can try frying the tortillas a little bit in some oil before you roll up the stuffing in them. Enchiladas are super fun to make and if you would like to see more recipes aside from the ones we have discussed; you can check out this cookbook or The Tex-Mex Cookbook. Don’t forget to feel me in on all the cooking goodness when done.